Reed Street Productions will kick off its first zombie race in Maryland, just in time for Halloween. NEW YORK (CNNMoney) -- Zombie mania is sweeping the country, but so is the obstacle course craze -- complete with tortuous tracks, pocked with mud pits and tall walls. Now there's a company that's combining the two: zombies and boot-camp style race courses, and it's just in time for Halloween. On Saturday, Reed Street Productions will launch its first zombie-infested obstacle course race in the woods of Maryland. Ryan Hogan, a managing member of Reed Street Productions, said that 9,700 runners have bought tickets to compete in the Run For Your Lives race, where they'll run a 5K track and negotiate a dozen obstacles. "This is our first event, and we never expected 10,000 people to show up on our doorstep," said Hogan, adding that 1,000 spectators have also bought tickets to watch the mayhem from the sidelines. "It's kind of faddish, in a way, because we just got over vampires, and then it was werewolves, and now it's zombies." The company site says that runners will climb a hill, clamber up a fence and splash through a muddy sewer tube with a "bunch of flesh-starved undead on your tail." Reed Street Productions has been charging $77 for competitors and $32 for spectators to attend the race in Darlington, Md. Competitor registration closed on Oct. 1, but the company is also selling tickets for seven zombie-infested races around the country next year. Hundreds of volunteers have signed on to masquerade as flesh-eating zombies and chase the competitors, said Hogan, who withheld exact numbers of the undead and other details of the course. "People just love zombies," said Hogan, explaining the motivation for the unpaid actors. Reed Street Productions, an eight-employee company based in Bel Air, Md., is adding this undead element to the endurance course craze that has risen in recent years. This trend includes the nationwide series of Spartan Races, culminating in the annual, 48-hour Death Race in Pittsfield, Vt., infamous for its 90% attrition rate. Competitors in the separate Run For Your Lives race will wear flags representing health points. Zombies will try to rip off the flags. A competitor is "dead" if he or she runs out of flags before clambering over the fence at the finish line and into the safe zone, where there will be a party with live music and beer. 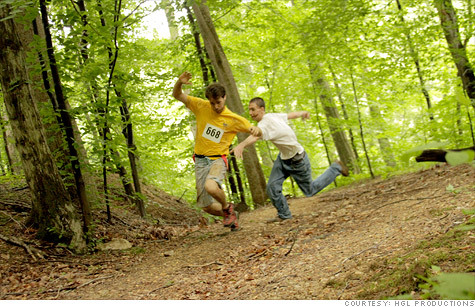 "Apparently, it's sort of like flag football meets the end of the world meets SERE meets running," said Devon Crittenden, a software engineer who will be running from zombies in the Amesbury, Mass. race, scheduled for May 5, 2012. Crittenden was referring to a military acronym that stands for Survival Evasion Resistance Escape, a training program for pilots and crew members who face the risk of being shot down. Hogan, a petty officer in the Navy and a former aviation warfare specialist, said that his SERE training was instrumental in designing the zombie course. Run For Your Lives is apparently the only race inspired by the zombie apocalypse genre. This genre originated with Richard Matheson's 1954 novel "I Am Legend" and George Romero's 1968 film "Night of the Living Dead," where outnumbered humans try to survive in a world taken over by homicidal ghouls. The race coincides with the latest manifestation of the genre: the second season of AMC's television show "The Walking Dead," which has brought the concept of the zombie apocalypse into the mainstream. A commercial advertising the race was broadcast during the season premiere. The show and the race follow the template established by Romero: zombies exist for the sole purpose of eating humans and are most dangerous when they cluster in mobs. Crittenden said that he has no military training and dislikes exercise. But he lives in the Pittsburgh area near the Monroeville Mall, where Romero filmed "Dawn of the Dead" in 1978, and he's had a lifelong obsession with zombies. "I picked this particular race because I hate running," he said. "Running is very boring. So if you're going to go running, you need motivation. What better motivation than being chased by zombies?"